The Paleo diet is gaining popularity, and it can be a good choice for people who have to avoid gluten whether because of a gluten intolerance or Celiac disease. Sure, if you’re gluten free there are many great options available like gluten free pasta and breads, but those can be very pricy. Sometimes it’s cheaper to just avoid those kinds of substitutes. 1. A Paleo diet can lead to weight loss. The savings here won’t be immediate, but over your lifetime, the savings is significant. I began following a Paleo diet last September, and in the 9 months since, I’ve lost 75 pounds. All of my numbers for cholesterol, blood pressure, and sugar count have improved. I know I’ve saved myself on medical expenses in upcoming years than if I hadn’t taken the weight off. As another point, I don’t know how many hundreds of dollars I spent on Weight Watchers over my lifetime. With a Paleo diet, I eat until I’m full, and I don’t get hungry again for several more hours. There’s no struggle, so weight loss is easy, and I don’t have to count calories or points or pay for the latest weight loss fad. 2. You’ll save hundreds by not eating out. Of course, you can eat out on the Paleo diet, but we just don’t eat out as much. We’re easily saving at least $200 a month on meals out. Now we go out to eat only when we’re traveling or for birthdays. 3. You won’t spend money on processed foods. You might think chips and candy and other processed foods are cheap, but when you buy them in quantities that most Americans do, they add up quickly. So, keep in mind these initial savings once you switch over to a Paleo diet. 1. Buy your meat directly from the farmer. Ideally, you’ll want to buy grass fed and pastured meat. We buy 1/2 side of grass fed beef from my cousin’s husband. We get ground beef, steaks, roasts, etc. The meat averages about $5 a pound. There are also several grass fed and pastured suppliers near us, and we stock up whenever they have meat on sale. We have a deep freezer to keep all the meat. 2. Subscribe to a CSA. A CSA (community supported agriculture) allows you to buy organic produce straight from the farmer. This year, for $850 we subscribed to one that gives us 1 and 1/9 bushel of vegetables a week for 19 weeks. There are enough vegetables each week to feed our family of 5 copious amounts of vegetables and some extra for us to freeze and use in the winter. I like to grow things that are expensive to buy in the winter like collard greens and kale. We blanch them and freeze them to add to soups in the winter for an extra nutritional punch. However, grow anything you like to eat that grows well in your area. 4. Buy produce on sale and stock up. If you live near a farm, consider going to the farm and picking the produce yourself. Last year we bought 50 pounds of organic blueberries. We froze 30 pounds and made jam and jelly with the other 20 pounds. It only cost us $130. However, within 8 months we ran out, so this year we plan to buy about 80 pounds to last us through the year. Likewise, Whole Foods recently had organic grapes on sale for .99 a pound. I bought 25 pounds and froze them so we’ll have grapes and grape smoothies in the winter. Initially, buying Paleo food can seem more expensive. However, there are many future costs you are eliminating by eating a healthier diet. In addition, there are ways to save, especially if you’re willing to buy in bulk and preserve your food. 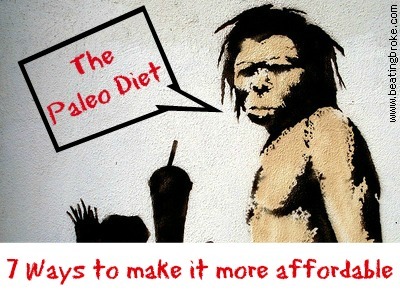 If you’re following a Paleo diet, how do you save money on groceries? 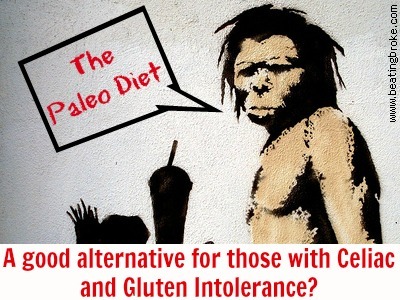 The Paleo Diet: A Good Alternative For Those With Celiac and Gluten Intolerance? Even if you don’t have Celiac, you may have trouble with carbs. I’m intolerant to gluten, wheat and many other grains. When I eat them, I feel like I can’t breathe and get dizzy. Thanks to my many intolerances, I turned to the Paleo Diet. The Paleo Diet is based on the idea that you’re health will be optimal if you eat like our Paleolithic ancestors did. That means eating grass fed meat, fish, fruits, vegetables, eggs and nuts. What’s off limits? Grains, rice, sugar, beans, processed foods, dairy, and certain types of oil. If you’re like most Americans, the off limit items probably make up a large portion of your diet, so if you’re thinking of moving to a Paleo diet, I recommend transitioning slowly. Maybe first give up sugar, then dairy, then grains, etc. Give yourself at least a month to transition off each so you don’t feel deprived giving everything up at once. Traditional meat on the market today comes from animals that are fed a diet heavy on corn and are fattened up on feed lots. Their diet causes them to produce less omega-3. When we consume the meat, we develop high levels of omega-6, which is bad for the human body and can cause inflammation. Cows and lambs especially that are fed an entirely grass fed diet are rich in omega-3, which is good for your body. According to a 2011 study in the British Journal of Nutrition, “Eating moderate amounts of grass-fed meat for only 4 weeks will give you healthier levels of essential fats. The British research showed that healthy volunteers who ate grass-fed meat increased their blood levels of omega-3 fatty acids and decreased their level of pro-inflammatory omega-6 fatty acids. These changes are linked with a lower risk of a host of disorders, including cancer, cardiovascular disease, depression, and inflammatory disease” (Eat Wild). If you’re going to be eating a large quantity of meat on the Paleo diet, you want it to be the best meat available. You may have seen the project where a photographer captured what families around the world consume in a week. What is most startling is how much processed foods and how few fruits and vegetables Americans eat. If you follow the Paleo diet, yes, you’re eating a diet heavy in meat (but if it’s grass-fed, it’s healthier meat), BUT you’re also eating a diet rich in fruits and vegetables. Before I began the Paleo diet, I’m ashamed to admit that I only ate 2 to 3 fruits and vegetables a day. Now I easily get 7 to 10 servings of fresh fruit and vegetables a day. Sure, maybe now you’re convinced that there are benefits to following the Paleo diet, especially if you have a gluten or even dairy intolerance. However, I’m guessing you’re probably ready to argue that the Paleo diet is too expensive to follow. While it IS more expensive than a traditional American diet, there are ways to cut corners and make the Paleo diet more affordable, which I’ll explain in my next post.